After a few moments of happy and exhausted celebration (see video), it dawned on me that we still had to get back down the mountain—a task that turned out to be nearly as challenging as getting up. But down we went, some (read: this writer) more slowly than others. The next day, I found myself crossing a much flatter surface, this time whiteknuckling it in a van along a piece of desolate highway on another planet called the Great Plains States. Riding an endless ribbon of blacktop that bravely cuts a narrow swath through the no-man’s-land from Colorado to South Dakota, I found myself bemused by the thought of “experts” telling us we have an overpopulation problem in this country. All the men and women on earth could live in the land we crossed that day, with plenty of room to spare. The sheer desolation of places like northern Nebraska makes it so that even a lone tree standing antisocially along the side of the highway becomes something to see and take note of. As we raced along, we were strangely comforted by the sight of an occasional heard of cattle, gathered together along the highway, trying to prevent the 100-degree heat from turning them into barbequed steaks. We nodded to them as we passed, happy to briefly have their company. This article first appeared in The Remnant Newspaper. Get access to exclusive newspaper features--Subscribe Today! The vast emptiness went on forever, your editor rather desperately clinging to the steering wheel at times, his sleeping children stacked like cordwood in the rearview mirror providing a sober reminder to keep it between the lines. Finally, the daunting nothingness turned into something: a pretty little place called Rapid City, South Dakota—the Black Hills, the Badlands, Crazy Horse, and Mount Rushmore. We’d made the halfway point. Lovely to look at, to be sure, but this was Sunday and we needed to go to Mass. Surely, we’d never find a Traditional Latin Mass out here! But South Dakota is not without its surprises. Years ago, I remember running into the great, great, great, great grandson of the Sioux Chief Sitting Bull and being pleasantly surprised when he told me that he’s actually a devout Christian, and so are many in his tribe. Not only Sitting Bull, but many of the Native Americans at the Battle of Little Big Horn, were, in fact, Catholics, having been introduced to the Faith and then baptized by Catholic priests such the great Jesuit missionary Pierre-Jean De Smet. Father De Smet was a traditional Catholic, of course, having spent his priestly life offering the Traditional Latin Mass every day. But that was a long time ago and we were traveling in the Wild West of Vatican II. With our seven children in tow, my wife and I entered through the rear doors of the church, only to be confronted by a familiar sight—dozens of small children crawling around on the floor, clinging to their mothers’ knees, haphazardly veiled, in little skirts and ties—trying manfully to keep quiet. I noticed a plaque on the wall, indicating that the old church is protected by the historical society. Thus, the beautifully preserved interior, high alar, patient statues, original stained glass, communion rail, etc. The Modernist marauders had obviously been barred at the door, Deo Gratias. As we made our way to one of the very few open pews, I could hear the old wooden floor creaking beneath my feet, and I was immediately brought back in time to the old framed country churches I’d known as a boy. I half expected to hear the telltale squeaking of an old pump organ’s bellows as I took my place. 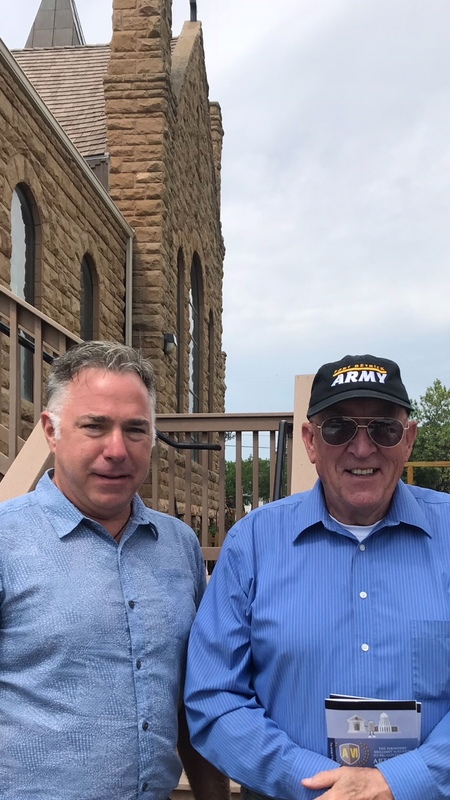 It was a hot day, and the doors of the church had been propped open to let a warm South Dakota breeze do what it could to keep the congregation comfortable. I saw farmers, old and young. Newlyweds, grandmothers and grandfathers, and children… large families, so many dresses, so many veils. The time machine was working just fine. At the altar a young priest, Father Christopher Hathaway, FSSP, was beginning the Prayers at the Foot of the Altar and my children quickly filled the empty pew, each one—even the youngest, Michael (6)—knowing exactly what to do: lower the old clunky kneeler and assume the position. It was, after all, the very same Mass they’ve been attending all their lives. We may have been in far off South Dakota, but the children were right at home in this church, which positively breathed traditional Catholic ambience. It was low Mass with hymns, and the choir was so reminiscent of those I’d known in my youth—devout, prayerful, not perfect but not pretentious, either; just dedicated parishioners, faithfully manning the loft every Sunday out of love for God and old Latin Mass. It was easy to pray as they sang the familiar old hymns of years past. The sermon was simple yet profoundly pastoral. Again, nothing pretentious and not too long, either—just the patient lesson of a loving father, teaching his children how to be chaste, how to be Catholic, how to get to heaven. Its catechetical simplicity engaged my children immediately. Familiar old hymns, chapel veils, fussing babies, stain glass-filtered light and the murmur of Latin—this place was home and these people, family. I knew them all, though we’d never met. The breeze picked up, and the consecration began, and I felt that same safe and Catholic peace I’d always experience as a boy in little churches likes these. God was coming down, kneel up straight. As we made our way to the parking lot after Mass, I was happy to bump into a man named Gary Velder (see photo), whom I’d never met but I instantly knew and liked. Gary is from the old days. I met him a thousand times before. He was always talking to my father after Mass when I was a kid. We talked for a few moments, Gary and I, and soon realized we had pretty much the same stories to tell—memories of the old days, the hotel Masses, the “roamin’ Catholics”. Gary had been there, too, all those years ago…and he remembers what it was like when the whole world thought we were crazy. Not so much anymore. Here we were, having just attended the “outlawed” Traditional Latin Mass, celebrated by a young priest in an historic church filled with babies and large Catholic families. In the few moments we were together, Gary and I smiled a lot. It’s been a long haul, but God is good. It was like two seasoned soldiers chatting briefly behind the frontline. It went without saying that they’d taken most of our churches, but they never managed to take our faith— and they never will. Gary told me that he and his wife, Linda, sometimes attend the Latin Mass at St. Joseph Catholic Church in Spearfish, South Dakota, as well. So, they have TLM options way out there in the badlands. Who would’ve thought! Father Hathaway has been offering the Latin Mass out there for ten years, and Gary told me the community is growing rapidly in Rapid City—a happy reality I’d just witnessed firsthand; the church was packed out. He didn’t say, but I’ll bet Gary never thought he’d live to see the day when the old Mass would return like this. I know I never did. And yet here it is, not only surviving but thriving even in the most unlikely places. There’s still so much work to be done, but the return of the old Latin Mass— touchstone of the Old Faith—to so many places in the world today should surely give us all the hope we need to continue on and to persevere in the good fight. God has not abandoned us. He’s not left us orphans. For a while there it seemed like maybe He had. But, no, He was there all along, just sleeping in the boat. As I said goodbye to Gary, my thoughts returned to the mountain in Colorado that from the ground had looked positively insurmountable. But it turned out not to be. It just looked that way. It was an optical illusion. All we had to do was keep putting one foot in front of the other, confident that the summit was waiting for us just above the clouds. It's not easy being Catholic right now. We've got problems, lots of them. But we've got to keep going, lift our eyes to the hills, never give up, and in a little while we’ll all meet merrily at the top, content with the knowledge that we did our best to do what our fathers had taught us to do and what God wants of us…nothing more, nothing less. We’re no heroes. We’re just Catholics trying to get over the mountain. Keep the Old Faith, and we'll see you at the summit.